Earlier this month, we told you about a mysterious, potentially biological white web that was found growing on nuclear waste at the Savannah River Site. Now, Last Word On Nothing's Sally Adee has put together a must-read piece — including pictures of the growth — that explores what the white web is, what it isn't, and what we're all obviously hoping it is: the work of a new, super-breed of radioactive spider. 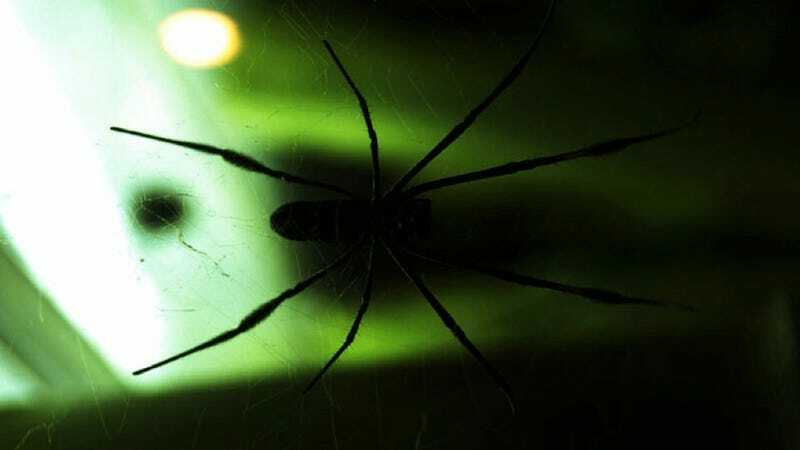 The Augusta Chronicle recently reported that a whitish, spider-web like material had been found growing all over the nuclear waste at the Savannah River Site, a Department of Energy lab in South Carolina. In the 1950s, nuclear materials were readied here for weapons deployment. Now the site is a research lab. The web-like strands were found in the L Basin, where the spent nuclear fuel is stored. Unlike the term suggests, however, "spent" nuclear fuel is actually so irradiated that it can no longer be reliably used. So it needs to be contained in vast pools of cooling water usually doped with boron, which acts as a protective measure against the fuel rods' radiation. The assemblies themselves, however, remain furiously hot. This makes the prospect of any living thing growing not just near them but directly on them incredibly exciting. It's not yet clear whether the stuff is actually alive, however. In late January, the Defense Nuclear Facilities Safety Board will start the process of testing the growths to see whether they are biological. Could these be microbes? Better yet, could these cobwebs (pictured below) be the home of some awesome new breed of radioactive superspider? Okay, so the superspider thing is strictly my own personal fantasy (too many B-movies as a child). But it wouldn't be the first time we've found bacteria and fungi thriving in apocalyptic dead zones. It wouldn't even be the first time we found them at Savannah River. In 2002, researchers there found a mysterious slime on a monitoring probe in one of the site's high-level waste tanks. That slime turned out to be Kineococcus radiotolerans, a microorganism that laughs at radiation doses a thousand times what would put one of us humans in a box. Genome sequencing at the University of Georgia revealed that "the content of the Kineococcus genome suggests purposeful adaptations to the high level waste environment." Then there was Deinococcus radiodurans, found happily munching on radioactive waste leaking out of the 50-year-old nuclear waste tanks under the Hanford nuclear reservation in Washington state, where United States produced the plutonium for the "Fat man" bomb that it dropped on Nagasaki. When other sectors have discovered industrious bacteria such as these, they've put them straight to work: oil-metabolising bacteria are now routinely deployed to gobble up oil spills. And indeed, extremophiles such as Kineococcus and Deinococcus could in theory be harnessed to help us neutralise the legacy of our nuclear waste. Unlike oil-noshing bacteria, these can't metabolise radioactive materials such as uranium and cesium-137- if only it were that simple. But they can provide a different service by immobilising them. When they leak out of holding tanks or seep into the ground after a disaster, soluble radioactive materials and toxic heavy metals migrate steadily wherever ground water migrates. Once they escape containment, radioactive sludge and toxic heavy metals in soil don't stay put. Liquid waste-or non-liquid waste that meets rain-travels inexorably toward a lowest point, and along the way it meets the water table. Once the waste hits water, it's found a high-speed escape route. The chaotic physics of flow and turbulence makes it nearly impossible to pinpoint the geographical location where the waste will end up, but one thing's clear-if it's in the water, it will end up in a plant, an animal or a person. Therefore, the most important aspect of cleaning up radioactive material is keeping it from ending up in the water. That's where superbacteria can help. While they can't make the radioactive materials any less radioactive, they can trap them. Michael Daly, a microbiologist with the Uniformed Services University of the Health Sciences in Bethesda, Maryland, has been working on engineering Deinococcus radiodurans, which can convert soluble uranium into an insoluble form that gets stuck in the ground. The difference between soluble and insoluble uranium can be thought of as the difference between food coloring and pepper. When you drop food coloring into a glass of water, the substance disperses through the water and there is no easy way to re-segregate it from the water. If, on the other hand, you drop a handful of pepper into the water, the pepper does not dissolve. Then, a filter can separate it from the water. Similarly, if bacteria can trap hazardous materials, they'll never make it into the groundwater. A new, radiation-resistant microbe would be a welcome addition to the Justice League cast of bacterial superheroes that could someday rescue the wastelands around the likes of Hanford and at uranium tailings sites around the world. The Department of Energy has estimated that over 2500 billion tons of soil and groundwater have been polluted by nuclear weapons production around the US. "That could cover 10,000 football fields a yard deep and keep Niagara Falls flowing for more than two weeks," Daly said. And actually, Deinococcus‘ superpowers aren't limited to locking up nuclear waste: The molecular mechanisms by which the bacterium protects itself from radiation are now also being exploited in other settings-for example, as radiation protectors for human cells and in the development of vaccines against scary drug-resistant pathogens like MRSA. So in these webs, are we seeing the first signs of another superhero bacterium to add to the arsenal? We'll find out sometime in 2012, when the review board finishes its analysis of the cobwebs. But I am far too impatient for that, so I called Daly. Sadly, he says all evidence points to the webs not being microbial. The conditions are far too clean-"they're lacking virtually any growth substrates"-to allow bacteria to make energy and build replicating cells. Savannah River spokeswoman Angeline French confirms that the tanks are pristine. Inside the 3.4-million gallon tank, a 1600 – 2000 gallon-per-minute recirculating filtration system removes suspended solids from the water using sand filters. A 150 – 250 gpm recirculating deionization system kicks out both radioactive and non-radioactive ions. In other words, there's nothing in there for a living thing to eat. But all that's in theory. You'd think the same clean-room rules would have applied to the pond where they nonetheless found Kineococcus radiotolerans sliming up the joint. Until the review board finishes its analysis, however, Daly says he's betting the webs are strands of oxidised metal. Specifically, he notes that if the water is spiked with boron, the strands could be boron trioxide, a white, glassy solid that results from boron, a metalloid, being oxidised. Metals will often oxidise this way under extreme conditions, say being mercilessly irradiated by high level waste. At least, that reaction has been well established for iron and manganese. Daly says he's never seen oxides form strands, but under the circumstance, he thinks it's a more convincing explanation than bacteria. "However, none of this leaves out the possibility that a spider fell into the spent fuel tank, and the extremely high doses of radiation immediately caused it to evolve gills and develop incredible superpowers," Daly did not add. He absolutely did not say that. Sally Adee is the technology features editor over at New Scientist and part of the ragtag team of awesome science bloggers that comprise The Last Word on Nothing.